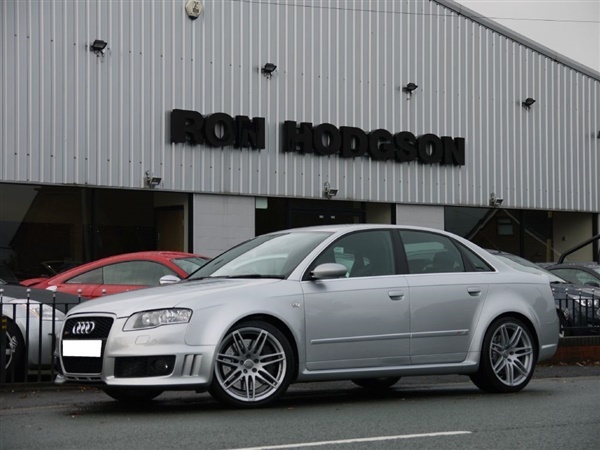 Ron Hodgson Specialist Cars Are Very Pleased To Offer For Sale This Beautiful Audi RS4 Saloon. This Particular Example Is Finished In Light Silver with Black Leather Upholstery with Carbon Fibre Interior Trim. The Specification Consist Of Adaptive RS4 Bucket Seats, Heated Seats, Audi Satellite Navigation System, Radio with CD Changer and Bose Sound, Multi Function RS4 Flat Bottom Steering Wheel, On Board Computer, Duel Zone Climate Control, Cruise Control, Front and Rear Park Sensors, Adaptive Xenon Headlights with Auto Activation, Front Centre Arm Rest, Alarm with Remote Central Locking, Recently New Brakes, and 19"RS4 Alloy Wheels with Matching Pirelli Tyres. This Is A Lovely Well Cared For Example with Full Audi Service History. This advert is for an Audi RS4, click Audi RS4 in Skelmersdale to see more cars like this in the local area. Want to search further afield? Click Audi RS4 in Lancashire - Greater Manchester to search for similar cars in the wider Lancashire - Greater Manchester area.